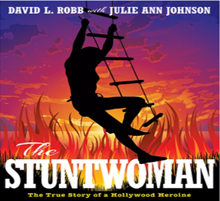 As Helen Thurston was up to her old tricks, hefting men over her head, a 26-year-old woman, who would have a leading stunt career, was in Denver, Colorado, facing facts. Polly Burson's grandfather had been a champion bronc buster, her parents owned a riding and roping show, and had encouraged their daughter's talents, trick riding and showmanship. She became a rodeo champion, galloping around arenas in Europe and all over America, including four years in Madison Square Garden. But in 1945 Polly wasn't at the top of the rodeos, she was "going back down to the 15, 10 and 5 shows" where she'd started. "I didn't want that," she said. "I had to change my life." Polly's mother had been an outstanding horsewoman. "She had a combination that very few people have: hands and feet on a horse. That means the position of a rider's hands and feet; the heels are down, the hands are just right, and you become part of the horse," Polly said. "It's a natural talent that can't be taught and the horse knows it!" Her mother worked rodeos with Babe DeFreest, a leading horsewoman who had left the circuit for movies. Having few options and no real education, Polly felt she had to fall back on movies and use her trick riding. She called Babe to ask if she had a chance. Babe said, "Get in! There's room for you!" Babe and Helen Thurston had started at Republic in the mid-1930s. In her first stunt job, Babe had doubled Jean Carmen, a serial star in The Painted Stallion (1937). On location in St. George, Utah, they checked into a hotel. "At dinnertime we got the shock of our lives—Utah was dry," director William Witney wrote. In the team spirit of rowdy Republic, a dry state did not prevent Ray Taylor, one of the directors, from getting royally drunk. In the middle of the night, he was banging on Babe's door. Yakima Canutt, who doubled two of the leading men and probably gaffed the stunts, wrestled Ray down the hall and threw him in a bathtub full of cold water. Witney went back to Babe's room and knocked. "She peeked out, then opened it. She stood smiling at me as I asked if she was scared. She moved to a chair, picked it up over her head and held it like a club. 'Hell, no. Why didn't you let him come in? I was ready to greet him!' she said, shaking the chair." "Babe had recommended me," Polly said softly. "It was on a serial, The Purple Monster Strikes. She doubled the star, Linda Stirling, and I doubled Mary Moore, who at that time was married to Clayton Moore, who was not the Lone Ranger yet." Moore played a Martian that tangled with heroine Stirling. "Babe and I had to do a fight on the edge of a cliff and then fall off it," Polly said, "but when we got up there, I looked down and said, 'Babe, there's no damn way we can get there from here.' It was about 75 feet to the bottom. They'd built a platform down there and the grips and all the men held up a net like a round firemen's net. Babe said, 'Don't bounce, grab something and go to your back.' I don't know if the wind blew me off, Babe pulled me off, or I stumbled off, but we both hit right on the 'X.' I made $150 and thought, my God, this is the gravy train! Then I didn't work for a month." On the great training ground of Republic Pictures, Polly doubled starlets Ilona Massey and Peggy Stuart, she met Helen Thurston, and stuntmen she'd work with for years—Carey Loftin, Cliff Lyons, Henry Willis, John Daheim. Polly had no idea she was about to board the big gravy train—Paramount Pictures' production of The Perils of Pauline. Compared to Pearl White's serial in 1914, the 1947 movie was treacle. Polly probably made less to double Betty Hutton than Pearl earned in the original, but it was fitting that thirty-three years later a story of Pearl White's first hit launched an important stuntwoman's career, and that the director, George Marshall, who had boosted Helen Thurston's stunt career in Destry Rides Again, would do the same for Polly. 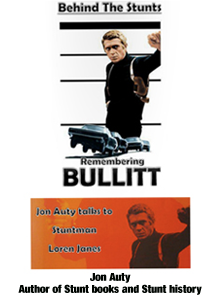 At the time, action directors knew the kind stunts they needed and hired the stunt players. When Polly arrived at Paramount for the interview, Marshall asked if she knew how to do a 'transfer' onto a train. "I said, 'The only way I ever got on a train was I handed a porter a quarter and stepped on.' Mr. Marshall was just stood there looking at me, so I said, 'No, I don't, but here we go.'" Marshall didn't want her to ride up to the boxcar, grab the bar and pull herself onto the train. He wanted her to leap from the horse to the train. "So I'm up on a hill a couple of blocks away from the train and the railroad tracks," Polly said, "it's straight downhill and I have to judge the time I'll need to get to that first boxcar behind the coal car. I had to get in position to get to it and couldn't be pulling up—that would look phony. I wasn't behind, but I was whipping the horse so I could get to my ladder on the car. And that's timing. I had the best darn horse under me. I hated to admit it, but she was a mare. We were going as fast as we could, I reached the boxcar and went for it—I jumped on to it!" Polly and her galloping horse seem fused together until she rises up, makes a graceful easy leap away from the horse toward the moving train. As she sails off, her horse keeps racing on with the same unbroken rhythm and Polly lands on the train perfectly. "I had to stay between cars and shoot back at the Indians that were chasing me," Polly said. "Then I had to crawl up and run along the boxcar into the coal car, down the coal car into the engine room, around the engineer, and up to the cowcatcher. I had to do it three times and I couldn't figure what in the hell was wrong. Later, when I came close by the engineer, it was George Marshall, the director! He said he'd been a frustrated engineer since he was a kid. I said, 'Mr. Marshall, I wish you'd have practiced with somebody else.'"